Rosie is the ROCKSTAR dam, diva, STAR who helps to anchor our foundation herd -- she produces nothing but blue ribbon winners and champions. 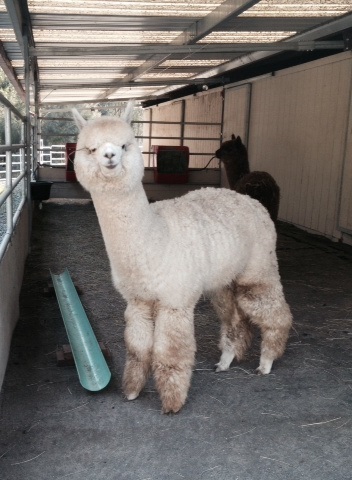 Our own Quantum Boogaloo (now breeding), ROCKSTAR's Maggie May (gorgeous) and most recently ROCKSTAR's Bon Jovi have come from Rosie and carry all of her wonderful fleece characteristics. 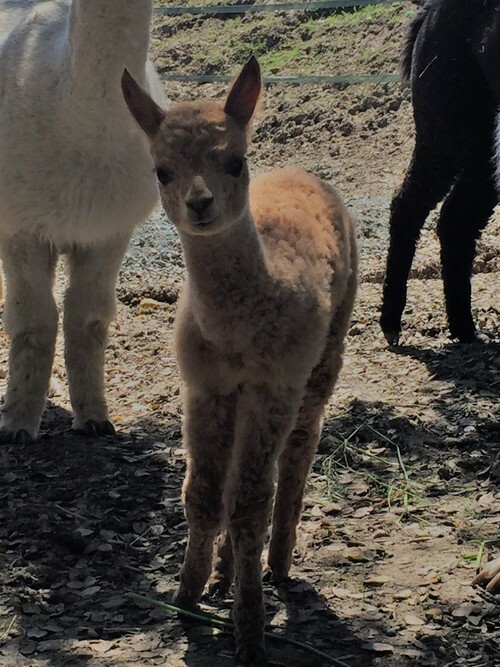 Rosie's cria's, much like herself are all calm, easy going and easy handling animals who exhibit serious substance of bone, dense, dense fleece that is uniformly fine in micron, character and color. She carries Hemingway, Felix, Hemingway's Tequila, PPPeruvian Ayabaca (awesome) and 5AVA Penelope in her background. Rosie, at age 10, is still sporting a 22 micron fleece with an SD of 4.0 and a lovely buttery feel to it with great brightness. Every year when we shear her she's one of those animals I can't wait to see the blanket on. Consistent, consistent, consistent! What more can you ask for? From early on Bon Jovi exhibited a beautifully, soft, bright white fleece that has stayed extremely fine, with lots of bundles densely packed onto a conformationally perfect and well-balanced frame. Crimp everywhere with fiber down to his toes. He has an awesome looking head, very level topline, perfect bite/jaw set and outstanding substance of bone. 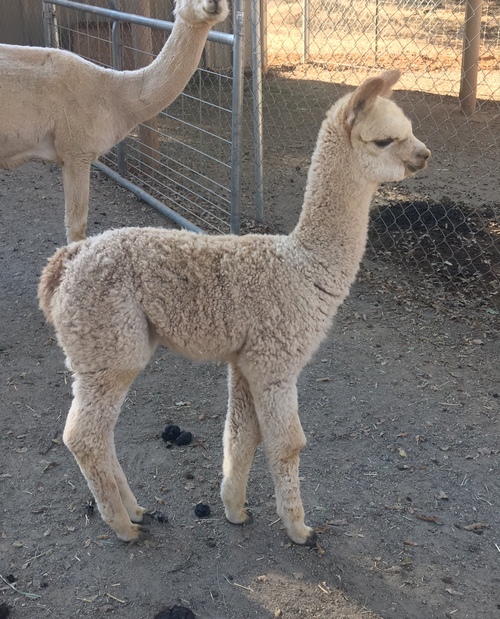 His first cria are on the ground (we are thrilled) and he is passing on his highly desirable fleece traits and phenotype to his offspring. 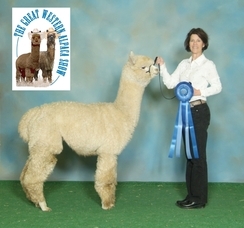 We have been thrilled with and were VERY surprised and pleased with Bon Jovi's appearances at GWAS and the International Alpaca Odyssey (IAO) in 2014 where he took the first place as a Yearling White Male and Reserve Color Championship in Cottage, first place in the Light Male Walking Fleece Show and second place just behind Snowmass Seventh Samuri in the Commercial Halter ring. Judges comments praised Bon Jovi's combination of fineness with density, brightness of fleece, length of staple/fiber architecture, overall uniformity, and lack of guard hair moving across his blanket, through the shoulder area and down his legs. 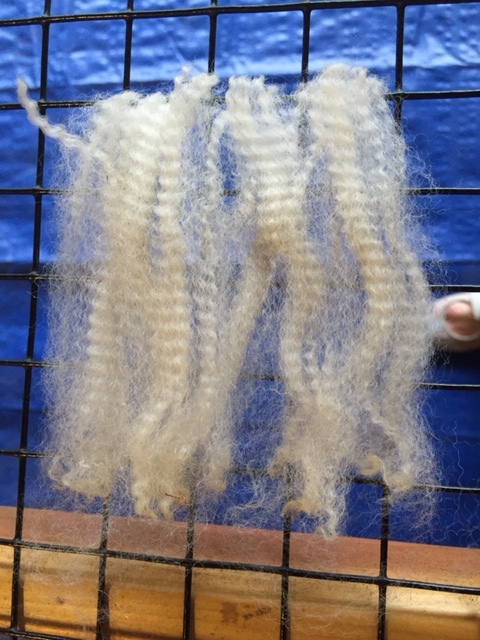 I nearly passed out as he was praised for these fleece characteristics in both the Cottage and Commercial show rings and could not be more pleased with the comments from Peter Kennedy at GWAS. In his only show appearance in 2015, BJ won 1st place in the male 2YO class and then went on to win the color championship as well. 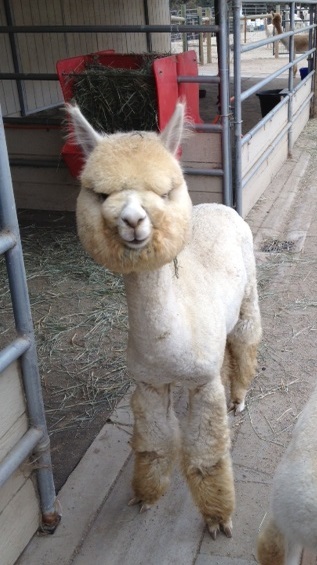 He's sporting some very nice fleece stats at age 3 with an AFD of 17.7, 3.8 SD, CV of 21.5% and .5 >30%. BJ's 2016 skin biopsy by Dr. Norm Evans confirmed some of what we were thinking in terms of density and unifrmity. Email me for a copy of the biopsy results. Most importantly, Bon Jovi represents the cornerstone of our breeding program which is to focus on that highly sought after uniformity of micron, fineness with density, brightness, lack of primary fiber and excellence in conformation.